Why should I continue to be tolerant? When the world has been so intolerant of me. 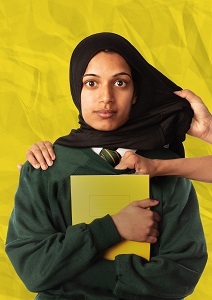 A new documentary play by LUNG (E15, The 56 and Chilcot), Trojan Horse follows the real life stories of Muslim teachers and governors who were accused of plotting extremism in Birmingham schools. Founded in Barnsley in 2012, LUNG are a verbatim / documentary theatre company who make work with communities, for communities and about communities. LUNG create work that shines a light on political, social and economic issues in modern Britain using people’s actual words to tell their stories. The company is led by Matt Woodhead (winner of Director’s Guild Best Newcomer 2015) and Helen Monks (Upstart Crow, Raised By Wolves). LUNG’s work is published by Oberon Books. Previous shows include: The 56, E15, Chilcot.